Haven’t decided on a hotel yet? 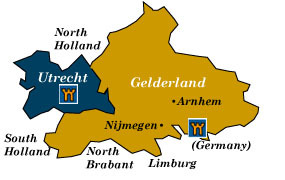 You can look at other available hotels in Utrecht and Gelderland with Booking.com. Beyond its eponymous 2,000-year-old capital city, the province of Utrecht—the country’s smallest—offers castles, manor houses, farms and museums spread out over a landscape of scenic beauty. Heaths and woodlands make up just part of the natural landscape of Gelderland, but always nearby are the castles, churches, fortified towns, and World War II memorials that give witness to the province’s long history. Utrecht One of the oldest cities in the Netherlands, with origins dating back to Roman times, Utrecht has always been a center of culture and learning. Known for its university, a vibrant atmosphere extends into its many cafes and restaurants. A ten-minute walk from the town center will take you to the Oudegracht, one of the most photogenic canals you can find, with shops, cafes, and restaurants housed in some of the former cellars and warehouses along the wharf. Domtoren A landmark of Utrecht, this 14th-century cathedral tower presides over the Domkerk, a magnificent structure that took three centuries to build. Views from the top, especially on a clear day, are fantastic. The Museum District In the heart of Utrecht, a number of museums present Utrecht’s cultural past: Dutch modern art, paintings of the 16th-century Utrecht school, and the history of Utrecht, including a 12th-century Viking longboat, are on display at the Centraal Museum. St. Catherine’s Convent is home to the Museum Het Catharijneconvent, which features an excellent collection of medieval religious art. If you’re interested in mechanical musical instruments, the Nationaal Museum van Speelklok tot Pierement—inside the 13th-century Buurkerk—has hundreds of them on display. A former railway station now holds over sixty historic locomotives, carriages, and wagons at the Nederlands Spoorwegmuseum. You’ll find a unique collection of Aboriginal art on display at the Aboriginal Art Museum. Rietveld-Schröderhuis Just outside of Utrecht, this 1924 home represents the high point of the Dutch de Stijl art movement as it applied to architecture. It has been a UNESCO World Heritage Site since 2001. Kasteel de Haar is one of those lucky castles that has been brought back to life with meticulous restoration (and some Rothschild money). Towers, moats, and a suspension bridge evoke a medieval fairytale atmosphere. Slot Zuylen This beautiful water castle is now a museum with rooms furnished in 17th- and 19th-period style. Slot Zeist Prince Willem van Nassau-Odijk had this palace constructed in the 17th century. Inside you’ll find stunning interiors. The Treaty of Utrecht was signed here in 1713. Kasteel-Museum Sypesteyn More of a grand manor house than a medieval castle, inside you’ll find a museum full of 16th-18th-century paintings and decorative arts collections. Kasteel Amerongen The original 13th-century castle was destroyed by the French in 1673, but it was soon rebuilt with double moats. From 1918-1920, German Kaiser Wilhelm II took up residence here. Huis Doorn began life in the 14th century as a castle, but was rebuilt into a manor estate. It was the final residence of German Kaiser Wilhelm II from 1920-1941. Kasteel Wijk bij Duurstede, dating from the 13th century, may be visited, but it’s used mostly for private events. Amersfoot A double ring of canals surrounds this charming medieval town center that holds over 300 buildings that date before the 18th century. A couple of fine examples are the Koppelpoort, which is a 15th-century double gate with a fortified bridge, polygonal towers, merlons, and arrow slit windows; and the Monnikendam, another 15th-century gate that is part of the outer fortifications. For a modern contrast, Amersfoot is the birth place of De Stijl artist Piet Mondrian. His house of birth, Mondriaanhuis, is now a museum dedicated to his life’s work. Paleis Het Loo Built by William III in 1692 as a hunting lodge, it became the summer residence of the House of Orange. It was also the home of Queen Wilhelmina until 1962. The palace has now become a fantastic museum of all things about Dutch royalty. Royal bedrooms, a marble dining hall, and formal gardens are yours to explore. Hoge Veluwe National Park Woodland, marshland, and sand dunes characterize the Netherlands’ largest park. But it’s not just back to nature that attracts visitors. The Kröller-Müller Museum is one of the finest in Europe, holding collections of paintings by Renoir, Monet, Manet, Picasso, and Van Gogh (The Potato Eaters is here). Arnhem Although heavily bombed during World War II, Arnhem has a number of interesting war museums and memorials in its environs. Southeast of Nijmegen on the German border is the Nationaal Bevrijdingsmuseum (National Liberation Museum 1944-1945), which through exhibits, original film footage, and lectures tells the story of Operation Market Garden. The Airborne Museum Hartenstein devotes itself to the Battle of Arnhem. Vorden is the jumping off point to explore eight castles in the nearby woodlands—Hackfort, Vorden, Wildenborch, Medler, Wiersse, Onstein, and Kiefskamp. A great day’s excursion is to visit all eight castles by foot or bicycle.